A crab cake is an American dish composed of crab meat and various other ingredients, such as bread crumbs, milk, mayonnaise, eggs, yellow onions, and seasonings. Occasionally other ingredients such as red or green peppers are added, at which point the cake is then sautéed, baked, or grilled and then served. 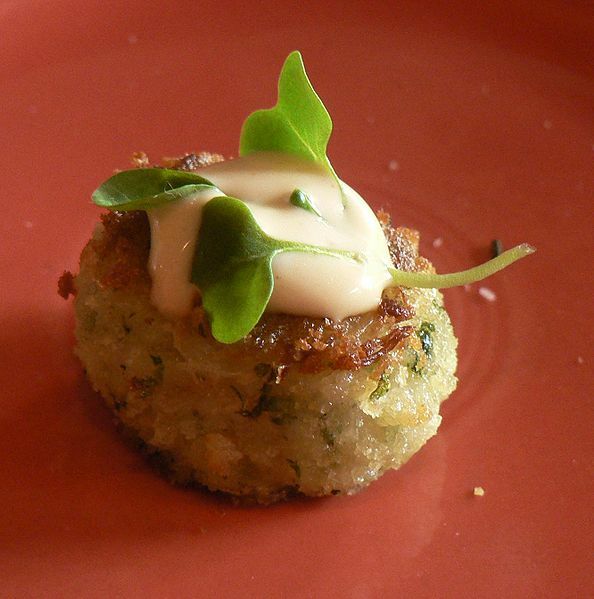 Left: Restaurant-style crab cake, with garnish. Crab cakes are traditionally associated with the area surrounding the Chesapeake Bay, in particular the state of Maryland and the city of Baltimore. The two most common styles of Maryland crab cakes are known as Boardwalk and Restaurant. Boardwalk crabcakes are typically deep fried and breaded, and are often filled with stuffing of various sorts and served on a hamburger bun. Restaurant crab cakes, which are sometimes called gourmet crab cakes, are often prepared with no filler, and are composed of all-lump crab meat served on a platter or open-faced sandwich. Many restaurants that offer Maryland crab cakes will offer to have the cakes fried or broiled. Meat from any species of crab may be used, although the meat of the blue crab, whose native habitat includes the Chesapeake Bay, is traditional and is considered best tasting. In the Pacific Northwest and Northern California, the endemic Dungeness Crab is a popular ingredient for crab cakes, and the cakes are prepared at many well-established restaurants throughout the region. Crab cakes are popular along the coast of the Mid-Atlantic States, the Gulf Coast, the Pacific Northwest, and the Northern California coast, where the crabbing industry thrives. Crab cakes vary in size from no bigger than a small cookie to as large as a hamburger. They are sometimes served with a sauce, such as a remoulade, tartar sauce, mustard, or ketchup. Break bread into small pieces and moisten with milk. Add Worcestersire sauce, parsley flakes, baking powder, Old Bay Seasoning, Salt, egg, and crab meat. Gently mix so as to keep as much of the lump crab meat together as possible. Shape Old Bay Crab Cake mixture into patties. Broil or fry the prepared Old Bay Crab Cakes until golden-brown on both sides.